What's Eliot Spitzer up to? These days I prefer hanging out with my kids--having dinner and encouraging them to do their homework and put aside Facebook for awhile. Client #9 answered a few other questions for TONY, including who's his favorite New Yorker (badass Teddy Roosevelt). And the former gov's downfall continues to pay media dividends. 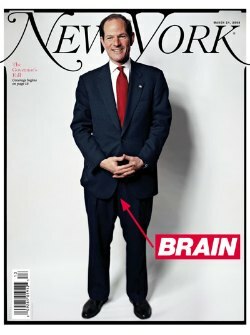 New York mag's "Spitzer's Brain" was nominated for Cover of the Year by the American Society of Magazine Editors. What a disappointing "interview". I'm surprised they didn't ask him what his favorite color is or how he takes his coffee. > of the Year by the American Society of Magazine Editors.